Move away from the comfort of open chords and find creative freedom by learning how to play all over the fretboard with our guide to nailing essential barre chord techniques. Moving chord shapes around the fretboard is the key to achieving total creative freedom in your riffs and songs. It doesn’t matter what kind of music you’re into - this special kind of moveable shape is found in all guitar styles. 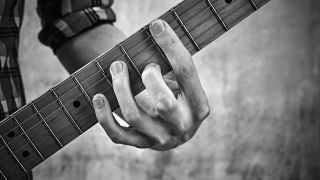 Known as a ‘barre chord’, the idea is to use one finger to play two or more strings at the same fret and it’s a great way to play nearly all the chords you need. Start by playing an open E chord with your second, third and fourth fingers, then slide the shape up one fret; this leaves your first finger free to barre across the 1st fret - producing an F chord in the process. Simply move this barre chord up one fret at a time to produce F#, G, G# and so on. Barre chords need strength, so these musical ideas will help you build up gradually, starting on two-string shapes and progressing up to full six-string examples. Master the hard rock rhythm style of Sunset Strip bands such as Guns N’ Roses and Mötley Crüe with these simple two-string barre chord shapes. Using your first finger for the 5th fret barre puts you in position to play each subsequent fret with another finger. Use a tight, controlled picking motion to help keep the idle strings silent. There’s a grungy Pearl Jam vibe here, but arpeggios like these extensions to a basic open A chord crop up in most musical styles, from rock to indie and folk. Use your first finger to barre across the 2nd fret and use your remaining digits to play the higher melody notes on the second string. Barre chords are a key part of funk and disco because a simple ‘lift off’ technique with your fret hand allows you to mute all of the strings - perfect for those momentary rhythmic pauses and for chunky ‘dead string’ percussive sounds. Make sure to use fret-hand muting wherever you see a rest in the notation - your guitar should be silent. This alt-rock rhythm part uses a barre chord based on the open E shape. Simply play the E shape with your second, third and fourth fingers so your first finger can play the barre. Keep your first finger close to the fret and in line with it. Your thumb should be in the middle of the neck, opposite your first or second finger for maximum strength. Producing clean, even-sounding barres can take time so be prepared to go through a period of trial and error. This may involve making small changes to the angle of your barring finger or the position of your thumb on the back of the neck. After some experiment you will eventually arrive at a comfortable barring technique that works for you.